New York, NY — The U.S. Consumer Product Safety Commission (CPSC) and Kolcraft Enterprises have voluntarily recalled Contours Options LT Tandem Strollers for fall and choke hazards posed to consumers. The CPSC announced the nationwide recall on July 24, 2012. The recall was issued after discovering that the front wheel assembly can break, which poses a fall hazard to the child in the stroller. In addition, for strollers manufactured in January and February 2012, the nuts that hold the stroller’s basket support screws in place can detach, which also poses a choking hazard to young children. “This recall involves all Contours Options LT tandem strollers with model number ZT012. The model number and date of manufacture are printed on a label found on the rear leg of the stroller. 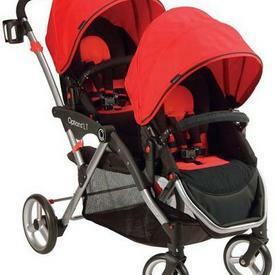 The dual-seat strollers have one mesh basket beneath both seats and were sold in two color schemes; black with red canopies and accents, and gray with yellow canopies and accents. ‘Options LT’ is printed on a bar along the side of the stroller,” the CPSC reported. Consumers are advised to contact Kolcarft to receive free replacement wheels and nuts for the basket support screws. For more information about the product recall, consumers can contact Kolcraft toll-free at (800) 453-7673 between 8 a.m. and 6:45 p.m. ET Monday through Thursday, 8 a.m. to 3:30 p.m. ET Friday, or visit www.kolcraft.com.